Give the Gift of Healing! Do you have a loved one with an issue you long to see healed for them? Perhaps it's an illness or disease. Or a success issue, such as inability to find our keep a job. Because you care, you want to help. Ordering a Healing Codes custom coaching session may be just the thing that will turn their situation around. Imagine the joy of having your loved one heal from what bothers them the most. It may be the best gift you could ever give--the gift of having your loved one heal the source of their issue, which is what The Healing Codes do. You may give this gift in a number of ways. You may buy a custom code session and have them interact with me. You may get the session alone, or if the person does not own the book, you may give them the book and session. 1. Order the book and custom coding session, have the book shipped to them, and have them get a custom code for their issue to do for him or herself. This works if you think the person is open to doing The Healing Code, and has expressed an interest. Perhaps they've seen changes in you since you've used The Healing Code on yourself, and would be open to reading the book and doing the Code. 2. Order the book and have it shipped to the person, and have me give you the custom code for them. Then you would do it on their behalf, as it explains in the book and Healing Codes Manual. 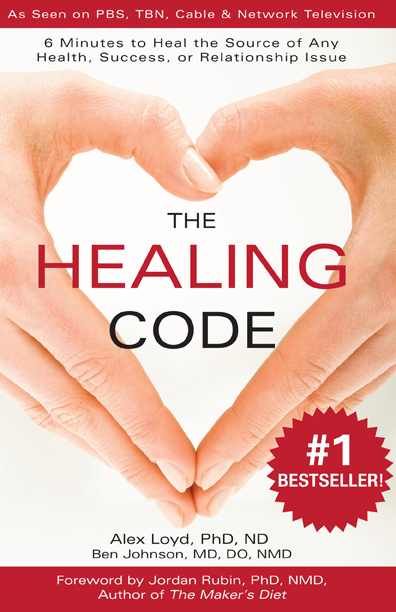 Requesting a Healing Code and doing it for someone else is a marvelous loving act that will benefit you as well. 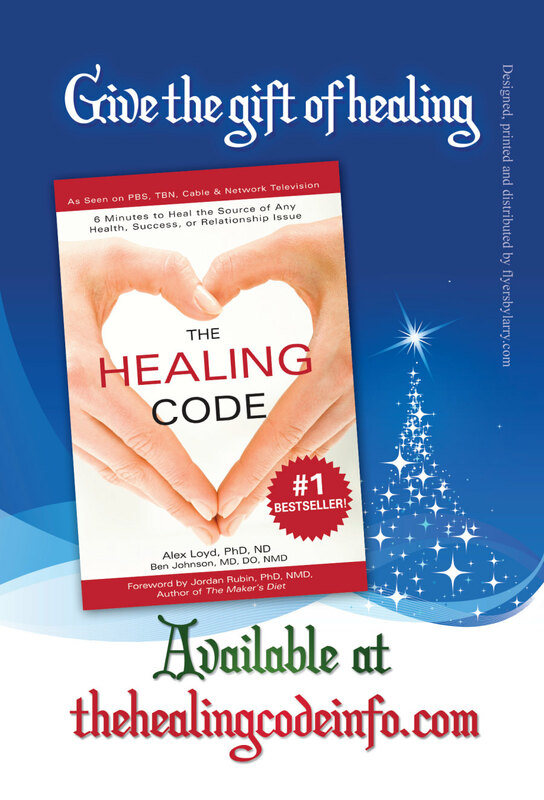 Dr. Alex Loyd says The Healing Codes are more powerful when someone else does them for another. Both people benefit. Please note: The order link below only applies to US orders ONLY. Canadian or International orders can no longer be filled by me (sorry!). Note: shipping is included in above price (for US orders only). You may order a custom coding session for yourself as well, of course. If your order is a gift, please indicate in "special instructions" that you want to give this to someone else. I will be in touch with you as to how we proceed. If your issue is especially urgent or strong, or you are new to The Healing Codes and would like some hands-on guidance, we can do a Coach-Guided Healing Code together, right over the phone. Remember, you will not only get the on-the-spot custom Healing Code for your issue, but also a "Code to go" to do on your own, either for the issue we did the Coach-Guided Code for, or sometimes another, related issue. That will be determined in our session. Order just the book, get free shipping. (But note: orders after 12/15 are not guaranteed to arrive by Christmas.) Your recipient will also get all my email helps, starting on Christmas Day, as long as you give me their email address. So far, I have been doing The Healing Code and mainly applying it to others. For instance, my cousin's wife, who was sent home (to die) on morphine, and with two MacMillan Cancer nurses to tend her. She is 85 years of age, and had spent 4 months in hospital before Christmas, then went back in 17 times over the past 6 months. She was seen by at least 3 consultants as well as all the other general practitioners and hospital doctors, had several scans, X-Rays, antibiotics, specialty clinic tests, gastroscopy, and was told she had an aneurysm, and that she was a very sick person. All of her blood counts were totally haywire, she had a severe ear infection, a bruised eardrum, double vision, breathlessness, dizziness, insomnia, elevated BP, severe constipation, and several other symptoms during her hospital stay that I can not remember right now. Her mouth and throat were very ulcerated and there was a large lump at the back of her gullet. She was only able to take fluid food for months. She was then told she had inoperable esophageal cancer, and accepted that she was going to die. She had a follow-up examination and went to see an ear nose and throat consultant several weeks later. He has since seen her three times, made various tests, and finally said a few weeks ago that he can find no trace of cancer anywhere in her body. She believes her amazing recovery is due to my doing The Healing Code for her daily. It seems to have totally resurrected her immune system in a matter of about 6 weeks.. She is on no drugs at all, and is eating everything, and eating well.